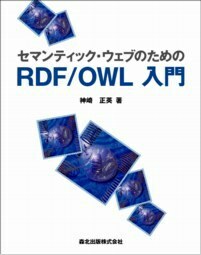 An Introduction to RDF/OWL is one of the first Semantic Web books published in Japan. It covers from Semantic Web background to RDF basics to complex RDF/XML syntax, as well as complete OWL explanation. The book also has hands on tutorial section to develop RDF schemas and OWL ontologies. In addition, the final section overviews the current situation of RDF query and inference, and Appendix provides a guide to RDF model theory. He was kind enough to ... show me some drafts-in-progress of the book. Of course I only really followed the pictures and examples, bt it is an impressive piece of work. It cover a well chosen range of topics, and even summarises RDF model theory in an appendix. Status: 2004-10-06 公開; 2005-01-06更新 .